Unfortunately I often have situation that I often need to go to another task or stop working for a while. That's why I need time tracking software. I prefer desktop software for Windows with one-time fee (or yearly for new upgrades). I don't need any invoicing module or sending reports for clients, it has to be just for myself. Best option would be setting manually timers which are visible in Windows tray and the software should stop timer after x min of inactivity. Of course there should be possibility to create tasks, clients and so on. And it would be great if there were some charts/statistics that let me optimize my time usage. I'm looking this kind of software for a long time but cannot find anything. Many solutions are just online, desktop ones usually doesn't offer any statistics/charts. None of them is what I'm looking for. What software (if any) do you use? What's your best solutions to optimize your time usage and not to be disturbed by e-mails / forum or any other tasks when you are realizing your goal? Toggl works for me for several years. It is an online service but they have a desktop app (as well as Android/iOS apps); Their desktop app detects the inactivity and asks you to keep or drop this time. The basic functionality is free and I like their online reporting features. They also allow downloading CSVs with your time and tasks; I used to write programs what took this input and created the invoices in the client-specific format, so there is a room for automation of your lower level bookkeeping. As to the tracking the time wasters, I use RescueTime (paid version); I set up a few messages what pop up when the trigger is met, like: "You spent a hour today reading news. Maybe you are updated enough to start working." and so on. 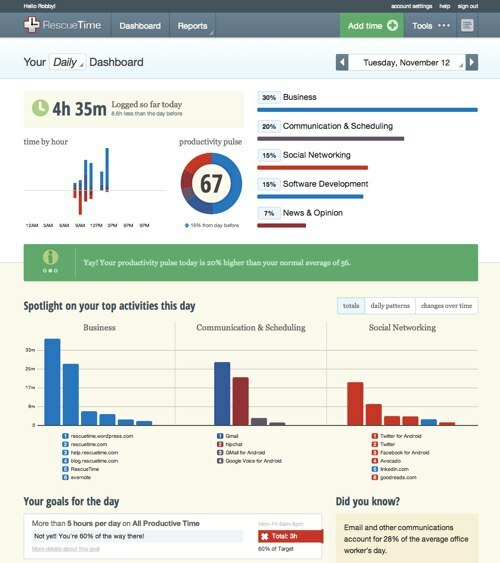 This might not solve directly your billing time needs, but it's really helpful to track your productivity and see where you spent your working time: RescueTime. You install a small application that stays in your tray and it tracks all your windows, generating later a report on your productivity. It can automatically categorize a LOT of applications, and for those he understands wrong or doesn't know, you can set what the window means: very productive, productive, neutral, distracting or very distracting. That sums up to a productivity score for your day. You can also ignore some applications that have no actual meaning and you spend very little time on (such as file explorers). I quite like TraxTime for this sort of thing. Simple punch-clock like interface, easy to edit the in/out times if you forget. Have you tried HiveDesk Yet? The tool servers great in terms of tracking time of remote workers, they offer a cross platform tool for Time Tracking and task management that makes remote team collaboration easier. It is a powerful and simple-to-use project management tool to manage your team and tasks. We have experience the best of satisfaction with this time tracking software. Not the answer you're looking for? Browse other questions tagged time-management time-tracking software or ask your own question. Am I free to bill the time when preparing for the work? Are there any small software development projects available for freelancers? How do time tracking application for software development freelancer work?